Apologies for the time-lapse since my last post, I have been very busy with production days and contributing to the exciting new CJS website Capture Cardiff. In the light of the above, I have decided to add some of my recent articles to this blog, particularly my reviews and comment pieces. I will start with last week’s DVD review: the new Michael Caine vehicle Harry Brown. From the opening scene of Harry Brown, it is clear the viewer is in for a harrowing experience. An unprovoked act of violence in broad daylight, in which a group of youths shoot a defenceless mother, is a microcosm of the moral abyss in which the events of the film take place. 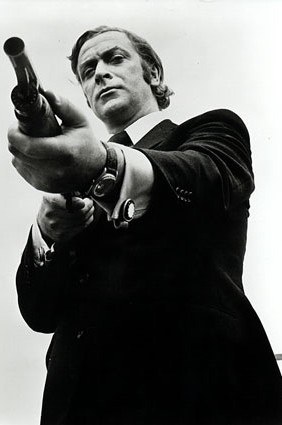 Michael Caine stars as the eponymous antihero, a vigilante who takes it upon himself to combat the rule of the violent and unrestrained youths of south London. But the real star is Ben Drew, who is beginning to forge an impressive acting career after a semi-successful foray into rap under the pseudonym Plan B.
Reminiscent of a young Vincent Cassel, Drew excels as the hollow villain of the piece. Few performances have disgusted and impressed in equal measure as much as his since Gary Oldman’s in Leon or Cassel’s star turn as Vinz in La Haine. The strength of the acting is complemented by an impeccable use of gothic London cityscapes, which transport the viewer back into a Jekyll and Hyde-esque nightmare in a way which is not at all artificial. Director Daniel Barber, making his feature-length debut, looks like an old hand. His command of subtle lighting and his use of silence or minimal dialogue add to the atmosphere of frightening uncertainty. The haunting tone of the piece leaves the viewer feeling distant and horrified throughout, yet undoubtedly affected once the film draws to its chilling climax.